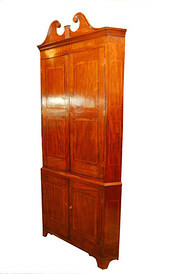 A WONDERFUL CHANCE TO OWN A SUPERB GEORGIAN FREESTANDING CORNER CUPBOARD AT A REALISTIC PRICE. ORINGINAL THROUGHOUT ,DATING AROUND 1780 AND IN TWO PARTS,THIS CUPBOARD HAS A SUPERB WARM COLOUR AND PATINATION. NOT OVER BIG MEASURING 1.98m 78"H AND 1.06m 42" WIDE, IT WOULD LOOK GREAT IN ANY ROOM. THE PEDIMENT TOP IS ORIGINAL AND GIVES IT THAT TOUCH OF "CLASS"